At an exclusive event in Seattle, Amazon has announced a brand-new Amazon Echo smart speaker. Revealed to a select bunch of technology journalists, with TechRadar in attendance, the speaker is a big update on the original Amazon Echo. It has a 2.5-inch woofer in it, a dedicated tweeter system and has been given a new decor with six shells available. There are even wood veneer ones. It is also smaller, too, which means that it's not as expensive as the original Echo. The new Amazon Echo is available today for just $99, £89 (about AU$127). Amazon is hoping that multiple Echo models will be bought by people, meaning that the Echo becomes a budget multi-room audio setup, which should have the likes of Sonos sweating. 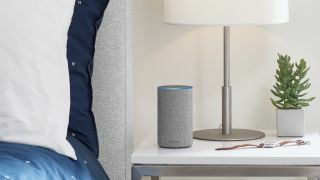 Amazon is also improving its Alexa API, so it will be easier for the speaker to talk to gadgets in certain rooms without actually having to say that room. So, if you want to turn off a light in the dining room and are in the dining room, only that light will turn off. This is a big thing for Alexa, as it makes the process of using the digital assistant easier. Amazon is also making it easier to group things, so in the morning you can have Alexa turn on the lights, your smart kettle, etc – all at once. Also available is Echo Connect, a speaker phone system that you just plug into your home. This is coming to homes in the US later this year, and early next year in the UK. Amazon also announced that Alexa will be integrated into BMW cars in 2018. In addition to this, Amazon has created Amazon Buttons – codeable buttons that can be used to play games with the Amazon Echo. These buttons will be available later in the year for $19.99/£19.99 or about AU$25.